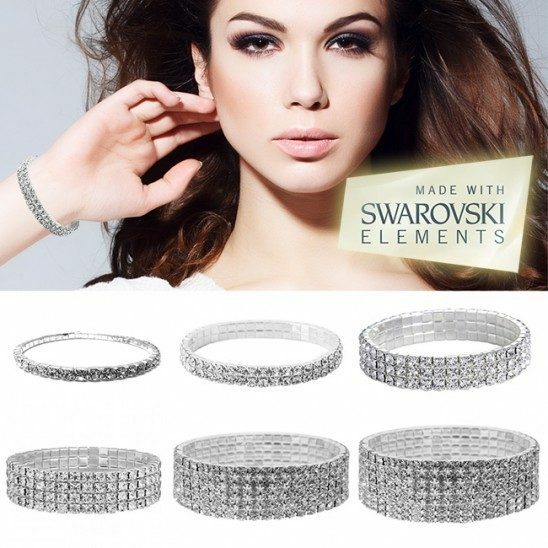 Swarovski Elements Crystal Bracelets - Single Tier Just $3.99! Ships FREE! You are here: Home / Great Deals / Swarovski Elements Crystal Bracelets – Single Tier Just $3.99! Ships FREE! Swarovski Elements Crystal Bracelets – Single Tier Just $3.99! Ships FREE! These look so great, sparkling but not flashy! Order the Swarovski Elements Crystal Bracelets – Single Tier Just $3.99! Ships FREE! These glamorous bracelets are stunning ranging from being single tiered through 6 glamorous rows of beautiful shine! These bracelets stretch to fit any wrist size, making it comfortable to wear all day and all night long. Perfect for any special occasion, but can also be worn with casual looks so you can enjoy them any time! Click here to check out more Great Deals!